The SPHL takes their most popular pastime to the highest level. CHARLOTTE, NC — Perhaps you have noticed this season has had several events involving the SPHL’s all-time favorite promotion – dachshunds (known as wiener dogs in these parts) racing on ice. Once the exclusive domain of hockey meccas of Huntsville and Knoxville, virtually every team in the SPHL over the course of the 2016-17 season have had the long, stubby-legged canines scurrying down rinks during intermissions. Coincidence? never! Commissioner Jim Combs has big plans for the little dogs. As a result of the widespread popularity of wiener dog races throughout minor league hockey, the SPHL announced today the creation of the first annual Wiener Dog Ice Racing World Championship will take place during the opening game of this year’s President’s Cup Final. Winners from the season’s previous wiener dog races across the league will have a speedy final showdown during the first intermission. Remember doggies… Second place is the first loser. Have at it, pups! Bonar preps for a run at the Cup… the Kelly Cup. After the stunning announcement of Allen Americans goaltender Riley Gill to remain in the tropical paradise of Puerto Rico to open a beachside massage parlor and rum factory, the two-time defending Kelly Cup champions tapped the SPHL to fill a huge void in net. The Americans defied conventional wisdom, avoiding their stalwart SPHL part-timer – Mississippi RiverKings goalie Peter Di Salvo – and snagged Sean Bonar away from the Fayetteville FireAntz. Bonar, the new SPHL single-season record holder with 31 wins, ditched the SPHL’s first-place team for a shot at some ECHL hardware. You read it right, folks… The league’s top goaltender and shoo-in for most valuable player has bolted due to semantics. Cottonmouths sold to a lucky buyer… On eBay. After it was announced the Columbus Cottonmouths were for sale, it was believed the historic charter member of the Southern Professional Hockey league would be off the market quickly. After a month of relative inactivity, the Snakes took to unorthodox methods (in professional hockey terms) to put the storied hockey club on the market. When she publicly announced the availability of the Cottonmouths, team owner Wanda Amos stated the franchise would fold if no buyer was located. Problem solved. The team was recently listed on the world leading internet auction site eBay. 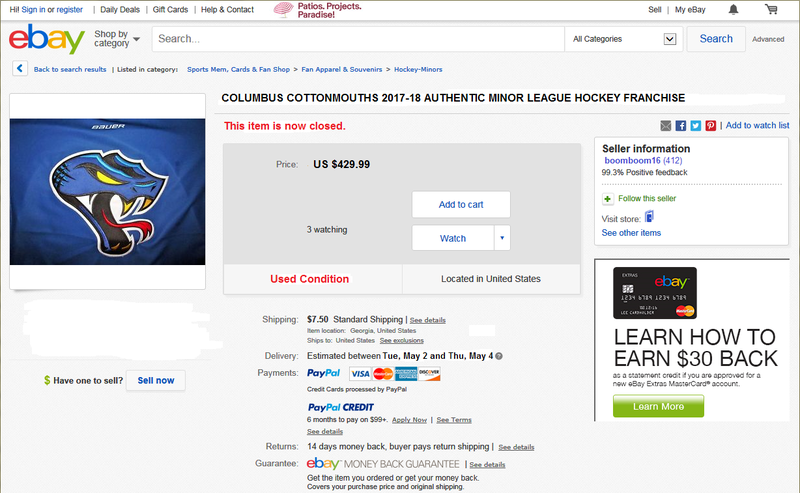 An eBay user with the handle “boomboom16” created the listing on the site under the heading “Columbus Cottonmouths 2017-18 Authentic Minor League Hockey Franchise.” Bidding ended this morning, with a winning bid of $429.99 from eBay user (name partially redacted due to privacy) “jgtr*******el”. In other news, the Peoria Rivermen will be making an important team announcement in a press conference later this afternoon. We’ll keep you posted on this and all of the other APRIL FOOLS announcements as they unfold! On behalf of all of us at The Sin Bin, we wish y’all a happy APRIL FOOLS Day!